(CNN) -- In August 2008, Najibullah Zazi, an Afghan-American, and two friends from his high school in Queens flew from Newark, New Jersey, to Peshawar, Pakistan, where they hoped to join the Taliban. In Peshawar, the trio met with "Ahmad," an al Qaeda operative who put them in touch with two al Qaeda leaders. 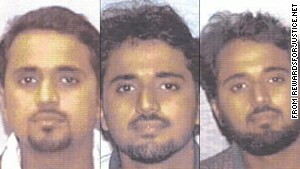 Those leaders asked the three from Queens to participate in attacks against the United States. Zazi refused. He wanted to fight the U.S. military in the fields and mountains of his homeland, not to kill American civilians in the streets of his adopted country. So, according to American prosecutors, al Qaeda's leaders brought in someone more persuasive -- someone who could speak to Zazi in his own language, someone who had also grown up on the streets of New York City in the 1990s, a man who had had a meteoric rise in the ranks of al Qaeda over the past decade from camp dishwasher to the leader of the group's operations in the West. His name was Adnan Shukrijumah. Eventually Shukrijumah would be added to the FBI's "Most Wanted Terrorists" list and a $5 million reward would be put on his head. And on Saturday, Shukrijumah was killed in Pakistan by the Pakistani military. Shukrijumah was born in Saudi Arabia in 1975, but his family moved to Trinidad in the '80s and then to Brooklyn in the early '90s. In 1995, Shukrijumah's family left New York for the Fort Lauderdale area in Florida, where he did odd jobs like selling used cars, earning money that he used to pay for his studies in chemistry and computer science at Broward Community College. Some Muslim men in Florida gave Shukrijumah books and videos about the holy wars in Kashmir and Afghanistan, and he was so moved by these stories of holy war that in late 1999 he traveled to Afghanistan to attend an al Qaeda training camp. Around this time, Shukrijumah told his mother that he was opposed to what he considered the excesses of the West, such as alcohol and drug abuse as well as the skimpy clothes that women wore in Florida. In May 2001, he left Florida again, and by June he was back in Afghanistan. Shortly after the 9/11 attacks, Shukrijumah called his mother in Florida, saying, "Did you hear what happened? They are putting it on the Muslims." His mother advised him not to come back to the States, and she said in 2010 he did not contact her again. It was Shukrijumah who, in late 2008, made the pitch to Zazi and his buddies from Queens -- Zarein Ahmedzay, another Afghan-American, and Adis Medujanin, a cab driver of Bosnian descent -- that they could help the cause of holy war best if, instead of fighting alongside the Taliban's tens of thousands of fighters, they went back to the States after their training by al Qaeda's bomb-makers and launched attacks there. At the time that Shukrijumah was making his pitch to the trio from Queens, the CIA drone war in the tribal regions of Pakistan was heating up. It was the last six months of President George W. Bush's second term, and the Bush administration had significantly amped up the drone program. Angered by the CIA drone program, Zazi agreed to return to the States to launch an attack. He also volunteered to be a suicide bomber, as did his two friends. They discussed with Shukrijumah potential targets such as the New York Stock Exchange and Times Square, as well as a Walmart store. Zazi returned to New York in mid-January 2009. He had been living on the Afghan-Pakistan border for five months, during which time he had been in almost continuous contact with members of al Qaeda. He was now ready to launch what al Qaeda's leadership hoped would be the most lethal terrorist attack in the States since 9/11. Luckily, Zazi's plan to blow up bombs in the Manhattan subway around the time of the eighth anniversary of the 9/11 attacks was detected by U.S. intelligence agencies that were monitoring the email account of a known al Qaeda operative in Pakistan who was in touch with Zazi. Zazi and his two friends were arrested before they could carry out the plot. It was Shukrijumah who oversaw this plot. After all, who better to oversee al Qaeda plots to attack the States than someone who had grown up in Brooklyn and Florida? A Pakistani army spokesman said on Twitter on Saturday that Shukrijumah was killed in South Waziristan along Pakistan's border with Afghanistan. The fact that Shukrijumah is now dead makes the United States a little bit safer from al Qaeda's plotting. And the fact that Shukrijumah was killed in a Pakistani military operation is a sign that Pakistan continues to expand its operations against militants based on its border with Afghanistan in a meaningful way, which has long been a demand of the United States. Finally, Shukrijumah's death is indicative of how al Qaeda's core organization that launched the 9/11 attacks continues to dwindle in size and capacity, because almost all of its leaders are now dead or captured. The elimination of almost all of al Qaeda's leaders in Pakistan suggests that the once-global organization may become just another Pakistani-based jihadi group with limited or no ability to operate outside of South Asia.